The Global series provides a quiet and compact design to fit any budget. 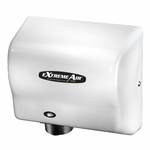 The GX1 automatic hand dryer offers the best value in a maintenance-free hand dryer. It is designed to provide many years of trouble-free service. The stylish, compact design provides great performance while consuming less electricity. American Dryer, Inc. has been manufacturing hand dryers in the USA since 1952. The company is headquartered in Livonia, Michigan.